Thank you for this opportunity to discuss our rapidly improving disability process. A few months ago, on Social Security’s 75th anniversary, President Obama noted that the Social Security programs are “a lasting promise that we can retire with dignity and peace of mind, that workers who become disabled can support themselves, and that families who suffer the loss of a loved one will not live in poverty.” To keep that promise, every day the men and women of our agency provide high-quality service to the millions of Americans who turn to us for help. I am proud to report that with the funding Congress provided in fiscal year (FY) 2010, we continue to deliver on our commitments to improve service and increase our program integrity efforts. Our accomplishments are particularly remarkable considering the continued surge of benefit applications and the furloughs of disability determination services (DDS) employees in many states. Eliminating our hearings backlog continues to be our number one priority, and we have made substantial progress in reducing the number of pending hearings and the amount of time a claimant must wait for a hearing decision. Our progress is not limited to the hearings workload. Our employees worked hard to keep the number of pending initial disability cases below our FY 2010 expectation even though our offices were flooded with a record number of new claims, and they did so while maintaining a higher level of accuracy than we achieved for most of this decade. Waiting times in our field offices dropped, and we achieved our best performance on the 800 Number since we began collecting data nearly a decade ago. We increased staffing for program integrity, which allowed us to increase the number of Supplemental Security Income (SSI) redeterminations and improve our SSI accuracy rates. I must give credit for these successes to our employees. From FY 2007 to FY 2010, they increased their productivity by an astounding average of nearly 3.7 percent per year. I am privileged to lead a workforce dedicated to the highest standards of public service. Despite the pressures that increased workloads bring, our employees embrace the challenges and voted us one of the top ten best places to work in the Federal Government for the third consecutive year. Our employees are grateful for the new employees now on duty in our offices, and we thank Congress for its support. In FY 2009, we received $500 million in Recovery Act funding to address our disability backlogs. For the past two years, we wisely used that funding and our annual appropriations to hire aggressively and work overtime to reduce our backlogs, handle more claims, and better serve the public. For the continuation of this important progress, we urge Congress to act swiftly to enact the President’s FY 2011 Budget. Our employees are proud of how far we have come over the last two years and they do not want to backtrack. We did what we could to prepare for the anticipated continuing resolution (CR). In July, we instituted a full hiring freeze for all headquarters and regional office staff. Since the beginning of FY 2011, we only authorized components critical to the backlog reduction effort to replace staffing losses. This plan is a temporary measure that we cannot sustain. Without enactment of the President’s FY 2011 Budget, we may be forced to impose furlough days, which would devastate all that we have accomplished over the last two years. We implore Congress to approve the critical funding that the President has requested for us. Over the last three years, we have implemented a comprehensive plan to eliminate the hearings backlog and prevent its recurrence by hiring more administrative law judges (ALJ) and support staff, adding new hearing offices, realigning workloads, and introducing technology and business process improvements. Our plan is succeeding. The Government Accountability Office validated our progress in July 2009 finding that we have a 78 percent chance of meeting or exceeding our target date of 2013 to eliminate the backlog. After pending hearings peaked in December 2008, we reduced that number by more than 60,000 cases. We ended FY 2010 with 705,367 cases pending, our lowest end of year pending since FY 2004. Two-thirds of these cases were pending less than 270 days, which is our target pending time. We have made these gains despite record FY 2010 receipts of over 720,000 hearing requests—a jump of nearly 100,000 receipts from FY 2009. Our ALJs are doing their part to drive down the hearings backlog. In FY 2008, we announced our expectation that each ALJ issue 500-700 legally sufficient hearing decisions each year. At that time, only 46 percent of the ALJs nationwide were deciding at least 500 cases. In FY 2010, without any significant change in the allowance and denial rates, 74 percent of ALJs completed 500 or more dispositions. Even though a lower percentage of Ohio ALJs currently meet the guideline, they are moving in the right direction. The percentage of Ohio ALJs meeting the guideline increased by 24 percent in the past year. Last week, I addressed our newest group of 73 ALJs at their swearing-in and emphasized how critical their service is to the public. I am confident that our new hires will meet the highest professional and ethical standards expected of an ALJ. We continue to work with the Office of Personnel Management to find and hire the most qualified ALJ candidates. Four years ago, we had cases pending over 1,000 days, and some as old as 1,400 days. Waiting this long for a hearing decision is simply unacceptable, and we committed to focus on the most aged cases. Over the last three years, we have decided over one-half million cases that were 825 days or older; now, we have essentially none. This year, we are aiming at resolving all cases 775 days or older. Even as we eliminated the oldest, most time-consuming cases, we reduced the average time it takes to make a decision by nearly five months, from a monthly high of 532 days in August 2008 to 377 days in October 2010—the lowest average processing time in more than six years. Moreover, every hearing office nationwide had an average processing time under 600 days in September and October 2010. We are speeding decisions to claimants throughout the country, including Ohio. Since May 2007, when I joined Ranking Member Voinovich in Columbus for a roundtable discussion with chief ALJs and hearing office directors, we have improved all of our major hearing office performance metrics in the State. 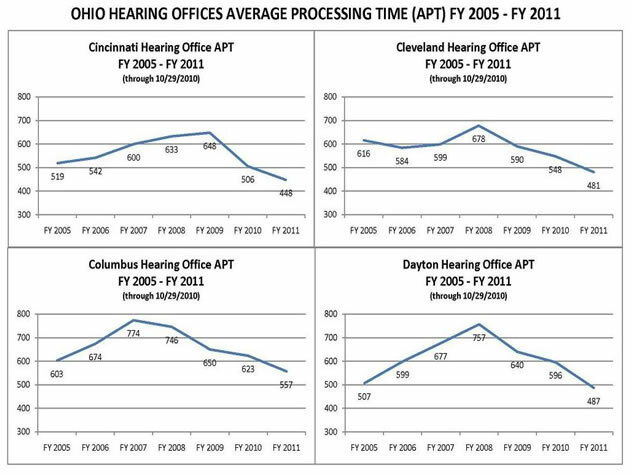 Four years ago, average processing times in the Ohio hearing offices were between 600-800 days. Now, the average processing has decreased to 400-600 days, and is dropping. We are making the greatest progress in the most backlogged offices. For example, in May 2007, the Columbus Hearing Office had the worst average processing time in the State at 760 days. By the end of October 2010, the wait time had decreased to 557 days, meaning claimants waited nearly seven months less for their hearing. The number of cases pending a hearing has dropped nearly 40 percent, from over 40,000 cases to about 25,000 cases. There are 50 percent fewer cases pending per ALJ, and the number of dispositions per available ALJ has increased slightly. In the last three months, we have significantly increased our capacity to decide cases. The Akron and Toledo Hearing Offices both opened in August 2010. With that additional capacity, we will drastically drive down the wait times over the next year. The Toledo Hearing Office currently employs 55 staff, including 10 ALJs. The Akron Hearing Office currently employs 64 staff, including 11 ALJs. I am pleased to report that most of these hires are already on-board. We also plan to add additional staff and space in the Cincinnati, Cleveland, and Columbus hearing offices. In addition, the St. Louis National Hearing Center, which conducts hearings using video, receives 300 cases per month from the Cleveland Hearing Office and 400 cases per month from the Columbus Hearing Office. Our hearing reduction plan includes innovative initiatives to make our business processes more efficient. We are using our attorney adjudicators to screen hearing requests to determine if they can issue a fully favorable decision on-the-record without the need for a hearing. In FY 2010, attorney adjudicators issued nearly 55,000 decisions. We built upon the success of our attorney adjudicators by establishing a Virtual Screening Unit (VSU) of attorney adjudicators to assist our most heavily backlogged hearing offices. These attorney adjudicators, who are stationed in hearing offices throughout the country, screen electronic cases and write favorable decisions. The VSU started screening cases in November 2009 and went into full production in January 2010. In FY 2010, the VSU screened more than 50,000 cases and issued over 15,000 favorable decisions. The VSU has assisted 55 hearing offices, including Cincinnati, Columbus, and Dayton. Centralized printing and mailing frees up hearing office staff from routine tasks, such as producing, folding, and mailing millions of notices annually. We electronically transmit documents from our hearing offices to a centralized print server for mailing. In FY 2008, all hearing offices began using this process. ALJs and attorney adjudicators began piloting the ability to electronically sign and centrally print decisions in FY 2009, which culminated in a national rollout in FY 2010. We also developed a standardized electronic business process (eBP) that establishes effective, efficient, and consistent case processing methods for all hearing offices. After successful testing and piloting, we rolled out the eBP to all of our hearing offices last fiscal year. We continue to update the process to incorporate electronic processing advancements such as automated issuance of notices, enhanced protection of personally identifiable information, and payment effectuation efficiencies following favorable decisions. We are expanding our Representative Video Project (RVP), which allows representatives who have purchased video-teleconferencing equipment to participate in hearings from their offices. Since FY 2009, we have held over 3,500 RVP hearings. We are piloting the use of a high-speed Internet connection in order to make RVP accessible to more representatives. RVP may be particularly helpful for claimants in rural communities, who otherwise would need to travel a long distance to attend a hearing. Our efforts to reduce the hearings backlog and issue more ALJ decisions have created additional work for the Appeals Council. To expand adjudicative capacity at the Appeals Council, we hired new staff. We revamped training programs to take advantage of recent technological improvements, and many of our new employees have exceeded performance expectations during their training period. Appeals Council dispositions of requests for review have begun to approach the level of receipts. We expect the tipping point—when dispositions begin to outpace receipts on a regular basis—to occur in FY 2011. These plans will make a difference to the American people but they are contingent on receiving a timely and sufficient budget. The President’s FY 2011 Budget allows us to hire 70 ALJs plus their support staff, increasing our ALJ corps to over 1,450 judges. The budget would also allow us to continue our plans to open or expand 19 offices this fiscal year. Together, these staff and office additions will allow us to reduce processing times and to complete nearly 815,000 hearings, an all-time high for the agency. Our budget goal is to reduce the hearings backlog by about 40,000 cases this fiscal year, and we hope to exceed that goal. While we drive down the hearings backlog, we must also respond to the increase in disability claims resulting from the economic downturn. The most important thing we can do to improve the disability process in Ohio and across the country is to make the right decision as early as possible. We must timely and accurately process claims at the first steps of the disability process. The surge in disability claims over the past few years has challenged our efforts to improve service at the first steps of the disability process. Nationwide, we received more than 3.2 million disability claims in FY 2010. These receipts represent about 632,000, or about 24 percent, more claims than we received in FY 2008. Refining policies and business processes to expedite case processing. Our strategy has produced measurable and meaningful results across the country. New hires in the DDSs and the Federal disability units, automation, fast-tracking of initial claims, and policy and business process improvements have helped us handle a record number of disability claims. We are on track to reduce the number of pending initial disability claims to the pre-recession level by 2014. While our pending levels have risen due to increased receipts, we completed nearly 350,000 more initial claims than the year before and kept the pending level about 200,000 cases below what we had anticipated. Our end of year average processing time was 20 days less than we projected. Despite the pressure from growing workloads, our most recent data show that the DDS decisional accuracy is at its highest level since 1997. By providing the necessary personnel, case assistance, and technological support, staff can focus on more accurately completing their work. Our disability adjudicators are increasingly utilizing our Request for Program Consultation (RPC) process. The RPC process provides a standardized way for disability adjudicators and quality reviewers to resolve quickly differences of opinion concerning disability determinations by identifying policy issues that are misunderstood, unclear, or difficult to follow. In Ohio in FY 2008 and 2009, a sharp increase in initial disability claims, high staff attrition, and a generally inexperienced staff all contributed to disappointing outcomes. Performance and productivity decreased, processing times climbed well above national averages, and pending workloads in the Ohio Bureau of Disability Determinations (BDD) reached an all-time high. The “cost-savings days” implemented by the State of Ohio further compounded these difficulties. We promptly responded to the negative trends in Ohio, and we were able to turn the situation around in FY 2010. The Ohio BDD needed additional case processing capacity, so we authorized the replacement of all staffing losses and allowed the BDD to increase its staffing by over 90 new hires in the last two years. Since it takes time to fully train new employees, we provided short-term assistance to the Ohio BBD by transferring over 15,000 cases to our Federal processing units in Chicago and Baltimore. We provided Ohio with one of the highest levels of assistance in FY 2010. In addition, we worked with the new leadership in the Ohio BDD to institute several business process changes to create a more efficient process for handling electronic disability claims. As a result, pending initial disability claims fell by 10 percent in FY 2010. Our proactive response has significantly improved the service we currently provide to Ohio residents. Ohio closed FY 2010 with a total pending level of 54,302 cases. We estimate that the total pending would have been almost 70,000 cases if we had not interceded with Federal processing assistance. Accuracy improved significantly from about 96 percent in FY 2009 to 98 percent in FY 2010, as our Federal assistance allowed BDD staff to focus on working fewer cases. Productivity is increasing as the new hires gain experience. The BDD is now in a position to handle the workloads. We phased out Federal assistance in July 2010, and we re-directed it to other states with a greater need. We are actively monitoring Ohio’s performance and progress, and we stand ready to provide additional assistance to the State if necessary. It is especially critical for our Ohio claimants that Congress approve the funding that the President has requested for us this fiscal year. The Ohio BDD’s FY 2010 staff attrition rate of 15 percent is higher than the national average of 10.6 percent. At a time when the DDSs need our assistance more than ever, a number of States have misguidedly imposed unnecessary and destructive furloughs on DDS employees. The Federal Government fully funds the salaries and benefits of DDS employees and all attributable overhead. It is wrong for States to respond to fiscal crisis by furloughing these employees. Through September 2010, furloughs delayed about $29 million in benefits nationwide and have cost States over $56 million in lost administrative funding for the DDSs. In Ohio, we estimate that the 20 furlough days in FYs 2010 and 2011 will result in over $7.3 million in lost Federal funds for the Ohio BDD. Additionally, the furloughs will delay the processing of nearly 16,000 disability claims, postponing over $3.7 million in Federal benefits to the State’s most vulnerable citizens. In an effort to stop these detrimental furloughs, the Administration has proposed legislation that would prohibit States from furloughing fully Federally funded DDS employees without the Commissioner’s approval. We have organized more detailed data about furloughs at www.socialsecurity.gov/furloughs. As the number of initial disability claims began to swell, we expanded our State and Federal adjudicative capacity. In the last two years, we provided the DDSs with the resources to replace staffing losses and to add about 2,800 more employees. The Ohio BDD replaced all of its losses and added over 90 new employees. The current staffing level in the Ohio BDD is 17 percent higher than at the end of FY 2008. We also added staff in our Federal disability case processing centers to assist the DDSs most adversely affected by the increase in claims. We currently have a Federal unit in each of our ten regions and two units in Baltimore that assist the DDSs with processing claims. We created four centralized units, similar to the NHCs, to assist states where needed. These units, called Extended Service Teams (EST), are located in Arkansas, Mississippi, Virginia, and Oklahoma. We chose these states because of their history of high quality and productivity. The ESTs have already produced significant results. 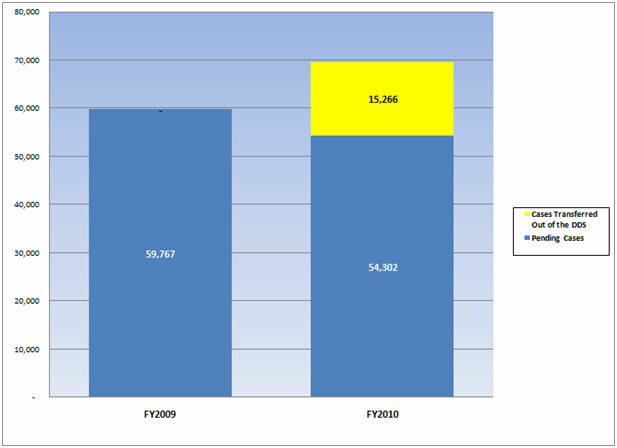 The combined sites handled over 25,000 disability cases in FY 2010, and we expect them to handle 76,000 cases in FY 2011. We are using technology to improve our disability claims process. We have developed quicker and easier online services to meet the Baby Boomers' expectations and keep pace with the increase in recession-driven disability claims. Our online services continue to be the best in government and exceed the top private sector sites in customer satisfaction. We have other initiatives underway to improve the electronic disability process. For example, we have streamlined the online Adult Disability Report, one of our key data collection forms in the disability process. Similarly, we are building additional online services, including an application for SSI and an online service for appointed representatives of disability applicants. These additions will provide the public with more services options and allow our front line employees to focus on more complex issues. We are also enhancing our most significant commitment to improve quality, the Electronic Claims Analysis Tool (eCAT), which is currently in use in 34 States and 4 Federal components. eCAT improves the quality of our disability determinations by aiding disability examiners in documenting, analyzing, and adjudicating the disability claim in accordance with regulations. We expect that eCAT will produce more consistent and better-reasoned determinations that contain easy-to-understand explanations of our decisions. In addition to enhancing the documentation, quality, and consistency of our disability decisions, eCAT has been an extremely useful training tool for the many new examiners in the DDSs. All States have the training version of eCAT. Training through eCAT is helping new examiners more quickly gain proficiency in handling complicated cases. We are also using eCAT to train experienced examiners in error-prone areas such as credibility and opinion evidence. Since it is working so well, we are accelerating the expansion of eCAT; every State should have it by April 2011. Developing and implementing a common Disability Case Processing System (DCPS) for all 54 DDSs is a technology challenge that we hope to solve within the next few years. Currently, each of the DDSs has its own unique case processing system, all of them based on old programming language. We are working with the DDSs to gather and implement the requirements for a new common system. DCPS will use modern technology to provide a better user experience for the disability examiners and to create the foundation for a state-of-the-art disability process. After we fully implement DCPS, it will be easier and less expensive to deploy new technology to our DDSs, such as health Information Technology DCPS will enable staff to provide better service to claimants and speed up the disability application process. We expect to award the contract for the development of DCPS this fall. We plan to begin beta-testing a common, web-based system at several DDS sites within a year after we award the contract. We are currently developing our implementation approach to minimize disruptions to service and maximize the benefit to the public. We will rollout DCPS nationally after we have successfully completed our testing. Health IT has the potential to revolutionize our entire disability process and significantly improve service to the public. Each year, we request over 15 million medical records on behalf of our disability claimants, and we store more than 485 million disability and medical documents. We rely upon doctors, hospitals, and other healthcare professionals to timely provide medical records. In FY 2009, we became the first Government agency to use the Nationwide Health Information Network, the Department of Health and Human Services’ (HHS) initiative to provide a secure connection to access electronic medical records. We are moving towards a fully electronic system of requesting and receiving medical records. With claimants’ consent, we will be able to instantaneously request and receive medical records electronically. Over the past few years, we have been using health IT to accelerate the disability process. Applicants treated at Beth Israel Deaconess Medical Center in Boston, Massachusetts or at MedVirginia facilities in Richmond, Virginia can authorize their medical records to be transferred electronically to the DDSs. Health IT allows us to request and often receive medical records in less than a minute, as opposed to the days, weeks, or months it may take using the traditional process. We used approximately $20 million in Recovery Act funds to expand health IT to 14 healthcare organizations in 12 States. We expect to receive over 110,000 electronic medical records annually from these healthcare organizations. Wright State University and HealthBridge, which serve Ohio, are among the healthcare organizations to which we awarded contracts. We expect our latest health IT expansion to improve further the speed, accuracy, and efficiency of the disability determination process. We believe that using health IT will also reduce the cost of making a disability determination for both the medical community and the American taxpayer. We continue to expedite determinations for those claimants who have medical conditions so severe that they obviously meet our disability standards. One of our most successful initiatives to improve the speed of our disability process is our fast-track effort. Using predictive modeling and computer-based screening tools, we are able to identify electronic disability cases involving medical conditions where a favorable disability determination is highly likely and we can quickly and easily verify the condition. Consequently, we can complete these disability claims in days instead of months. Our Quick Disability Determination (QDD) and Compassionate Allowances (CAL) identify claims that are likely allowances in the earliest stages of the disability process. QDD uses a predictive model to identify certain claims that are likely allowances, such as low birth-weight babies, many cancers, and end-stage renal disease. CAL allows us to identify quickly applicants who are clearly disabled based on the nature of their disease or condition. The list of CAL conditions originally contained 25 rare diseases and 25 cancers. We added 38 new CAL conditions in March 2010. We have held six public hearings to obtain critical information to develop and enhance this list of conditions. We held our most recent public hearing on November 9, 2010 in Baltimore, Maryland. We are using the information we obtain at these hearings to improve other aspects of the disability process, such as updating our program rules, enhancing our QDD predictive model, or providing helpful information to our claimants. For example, we often hear about the difficulties that claimants face as they wait for a decision. In March 2010, we began linking the over 3 million disability claimants we contact each year with important healthcare information, regardless of the outcome of their claims. Working with our partners at HHS, we direct disability claimants to websites provided by HHS, where they can find useful information and sources of assistance that may help them better understand and cope with their conditions or obtain help with prescription medications. In FY 2010, we used our fast-track initiatives to issue favorable disability determinations to over 100,000 disability claimants within 20 days of filing, while maintaining a very high accuracy rate. Identifying and paying eligible claimants early in the disability process clearly benefits those with severe disabilities and helps our backlog reduction efforts. Recently, we published a final rule that temporarily authorizes State disability examiners who handle QDD or CAL cases to adjudicate a case without a mandatory concurrence by a doctor, unless required by statute. This new rule will help us process cases more efficiently because it will give state agency medical and psychological consultants more time to work on those complex cases for which we need their expertise. We are continually looking for ways to improve and streamline our policies, procedures, and staff instructions, so that our employees can process work more efficiently without sacrificing accuracy. The Listing of Impairments (Listings) describe for each major body system the impairments considered severe enough to prevent an adult from working or for children, impairments that cause marked and severe functional limitations. The Listings are a critical factor in our disability determination process, and we are committed to updating each listing at least every five years. In the last five years, we have revised approximately half of the Listings, and this year we plan to obtain public comments on the remaining body systems. We currently use the Department of Labor’s (DOL) Dictionary of Occupational Titles (DOT) to determine whether applicants for disability benefits can do their usual work or any other work in the national economy. Since the DOL is no longer updating the DOT, we convened a panel of experts to provide advice on a new Occupational Information System that would address our specific needs for occupational information. We will continue to work even more closely with DOL and other Federal agencies during the research and development phase of this project. With appropriate funding, oversight, and hard work, we are on the way to giving the American public the level of service they expect from us. We developed a plan and have followed through to handle an unprecedented number of claims, improve service in our field sites, and increase program integrity efforts. I am proud of the real and meaningful progress our employees have made in the last three years despite challenges presented by the economy. Although we have not yet eliminated the disability backlogs that frustrate our claimants, we have cut processing time by about a third in the last three years and will continue to build upon our positive momentum in Ohio and nationwide. I have been to many of our field and hearing offices, including all of our Ohio hearing offices and the Ohio BDD, and have witnessed how personally committed our employees are to our mission. We know we cannot keep the public’s confidence without your help. Enactment of the President’s 2011 Budget will allow us to maintain our progress toward providing the level of service Americans are demanding.